Wooden charcoal pencil with just the word soft written on it. Paper wrapped charcoal pencil with 600-H written on it. White charcoal pencil with 558 written on it. Are there more varieties of charcoal pencils? What are their properties that make them different from each other? How does paper wrapping effect the charcoal pencil as compared to wood? Why would there be specific number written on paper wrapped pencil but not on wooden one? These charcoal pencils are just a demonstration of the styles of pencil you might encounter. The first pencil, labeled "soft" is a softer charcoal pencil, coated in wood. Wooden charcoal pencils are generally cheaper and require a sharp blade (ex exacto knife) to sharpen them. They would not easily sharpen in a traditional pencil sharpener as the charcoal is so soft that a regular sharpener would grind and break the charcoal during the sharpening process. The second pencil is coated in paper. 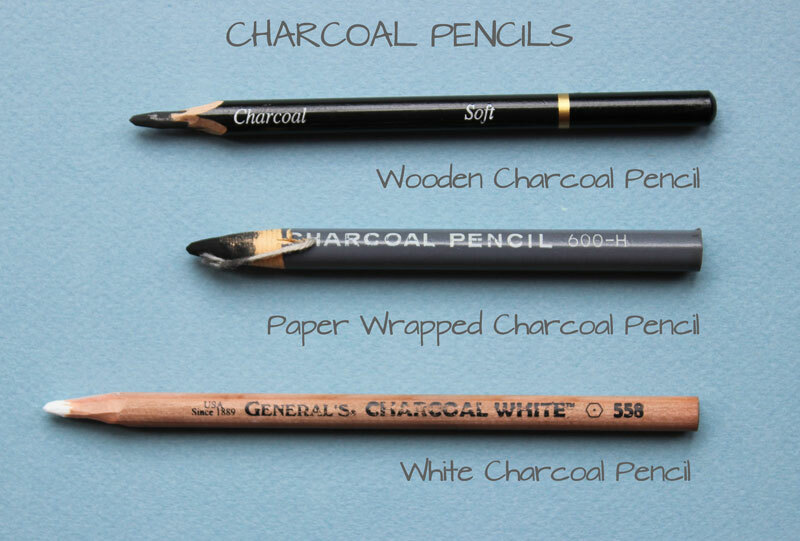 Paper coated pencils are generally more expensive, but provide the ease of being able to reveal more of the charcoal by simply pulling the string and unraveling the paper rather than sharpening the pencil with a blade. The 600-H identification on the pencil is just Prang's model number for that pencil and means nothing with respect to the charcoal grade. The 558 is General's line of white charcoal pencil and, like the 600-H is proprietary to the company and has no real meaning with respect to the charcoal. White charcoal is obviously different from black charcoal but is used in much the same way, but in reverse. White charcoal is a great way to come back after the work is finished to really bring out highlights and shines to be a "whiter than white" which brings contrast and boldness to an image. White charcoal really isn't charcoal at all, but a type of pastel or Conté, often chalky and meant to be used with charcoal. It can be made from mixing white pigment with some type of binder, but the exact makings are generally proprietary and not disclosed. I like the Carbon pencil. Wolff's Carbon by Royal Sovereign is the brand I have, but there are others. The Carbon pencil is a combination of charcoal and graphite. They draw smoothly, and can be smudged. There is no grit like charcoal alone. I use them as a layout for watercolor and pastel work, but I like to see the black outlines in my work. The Carbon pencil is easily erased with a putty eraser. How to draw duplicate items in perfect proportions and equidistant from each other in Mandala drawings?